Team Peru V presents different expertises composed by a professor of sustainability, a recent graduated in chemistry engineering and 2 students of biology from Universidad Peruana Cayetano Heredia and 1 geology student from Cal Poly Pomona (Irvine, CA). They are planning on undertaking several research projects at the Mars Desert Research Station (MDRS). Thanks to the crew’s wide range of expertise, they will be able to work on multiple scientific projects and experiments, explore the Martian analog environment, as well as study the behaviors, as called by professor Julio Rezende as Personal Sustainability. 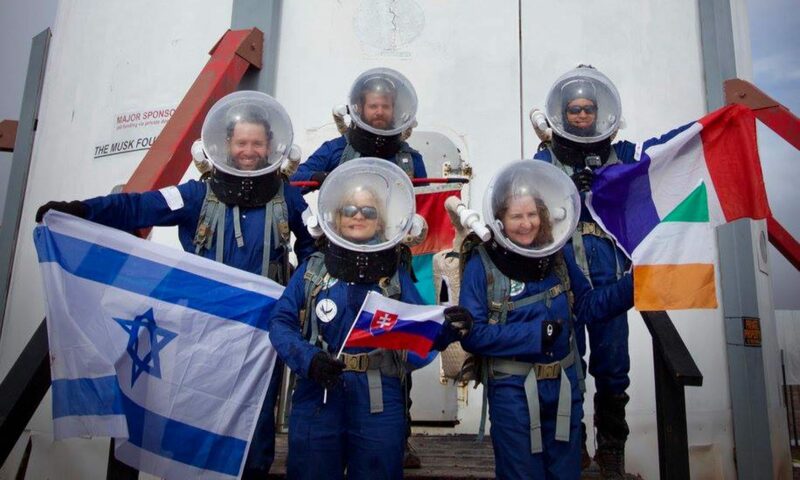 All of this will be performed an international atmosphere the crew first experienced together. The crew’s research is committed to propose some guidelines about how be sustainable in Mars settlements, but also in areas affected by climate change, such as deserts and regions as Brazilian semiarid. Following more planned research at MDRS. This research searches to answer the question: the Mars Desert Research Station (MDRS) operation can be more sustainable? It is evaluated how environmental, economic, social and personal sustainability issues are presented and is also reflected how MDRS activities would collaborate to Sustainable Development Goals (SDGs), proposing some guidelines to sustainability. It is also important to ask: the results related to Mars would be applied to build a self-sustainable habitats in Earth, mainly in areas affected by climate change as deserts and semiarid regions as can be seen Brazilian Northeast? Reviewing the previous research done at MDRS not was identified any research related to sustainability. Because of that, this research presents a possible great impact to MDRS. It is a challenger identifies the main dimensions that would be considered to evaluates a Mars research station in terms of sustainability and would be considered the great relevance of this research for the future of design of process of future Mars settlements. The purpose of this research is to Analyze Martian analog regolith residing in the vicinity of the MDRS area. The hab, along with much of the region surrounding Cow Dung road, is all part of the Morrison formation, which can be broken into two parts, the Brushy Basin and the Salt Wash Member. The research plans to obtain samples from both of these members at different locations in order to determine how much the regolith properties and composition can vary. On EVAs I take two samples: a LAB sample and an XRF sample. The LAB samples will be analyzed and classified while onsite at MDRS. Will be kept the XRF samples sealed for further analysis with the XRF machine at my University. It is planned on determining the quantities of the various different metal oxides in the soil, to see how much can be utilized in future missions with access to Thorium or fusion reactors. The first pioneers to colonize Mars will not have the necessary power to break down metal oxides, through electrolysis or smelting, but they will be able to catalog the types of available metals as well as the quantity of each. Previous studies show that the Martian soil allows plants to germinate and grow, without adding nutrients. However, not all plants have the ability to develop on Mars soil. The objective of this research is to determine the potential of Peruvian plant species to germinate and survive to Mars conditions (using the MDRS soils as analog soils). The importance of the research lies in the huge limitations of food and the poor dietary variety when colonizing Mars. Knowing which species have the potential to survive Martian conditions will increase the number of species that could grow on the red planet and will drive us a step forward to a successful colonization. – A quiz that has the next structure: presentation, instructions, general data, and a record sheet. – To calculate the Body Mass Index I will use a balance to measure the weight and an equipment to measure the size. To compare the results, a half of the crew will be exposed to the kiwicha cookies diet and the residual half, not. The group that will eat kiwicha cookies will consume it two packages per day in their breakfast. And the collecting of data will be every five days. This phase will be realized during the simulation program. Martian farming is, then, an important futuristic theme for human race, and not only a science- fictional dream. This century, when the spatial efforts will be centered on the Red planet, there is going to be an intense research on how to provide resources for future Martian exploration. But there are specific challenges for this technology, one of them being the fact that the soil required for plant cultivation needs organic matter. However, Martian soil doesn’t have a significant amount of organic matter (4), which is one of the indicators for soil quality (5). There are two solutions for this problem: Engineering Martian soil for supporting new life on it and modifying or treating plants in a way that they can resist these new challenging conditions. Both will be eventually used for an optimal Martian agriculture. Streptomyces sp. Strains will be tested to determine if they have the capacity to induce development on plants. Therefore, we will use radish as plant model. These plants have been selected as models because of their fast development. For achieving the desired results, these seeds will be treated first. Each group will contain 10 seeds for each species and treatment. Seeds will be washed with alcohol and sterilized water. These seeds will be exposed to Streptomyces spp. C2 culture, which will be grown in Glucose Yeast Extract (GYE) 1/10 broth (10). The control group will be only exposed to water and sterile GYE 1/10 broth. Then, the seeds will be placed in their respective container with Martian analog soil.